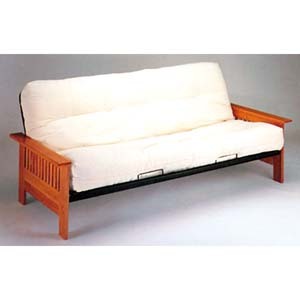 Mission Style Wood And Metal Futon Sofa/Bed In Oak Finish. Measures, 82Wx34Dx32H. 6 Futon Mattress In Natural Color Is Not Included In The Price. Mattress Size, 72x54x6H. Strong Construction. Easy To Assemble. IEM2511_.